We didn’t have a specific plan in Vietnam, we didn’t know how long we were going to stay and we only knew that we were going to travel from south to north by bus. In the end, we stayed the full month of the visa because we liked it a lot and we found many places to see. 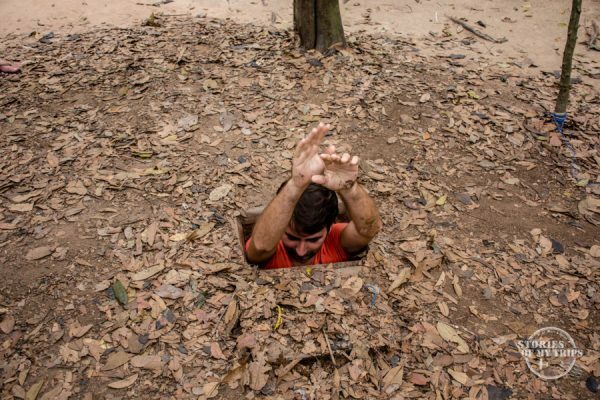 Traveling in Vietnam was easier than we thought. Public transport in large cities is very convenient and bus connections between cities are very good as well. These vary from very comfortable sleeping buses with beds (unless you are too tall) to small very uncomfortable buses. Walking through the cities is difficult due to the number of motorcycles on the street and on the sidewalks. It is true that crossing the street is an adventure, but after a while, you learn the technique. Riding a motorcycle can be intimidating, we only did it outside of the cities. 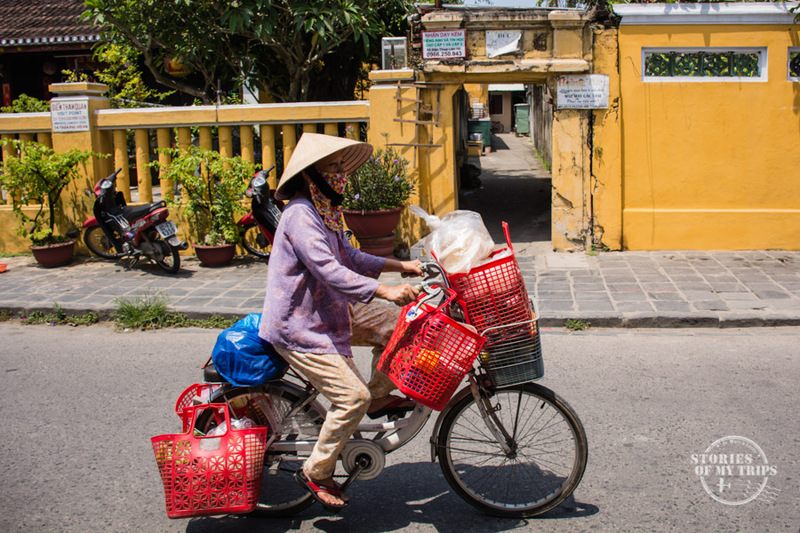 In this post, we tell you all the details of transport in Vietnam between cities and within cities and how we went around the country so you can plan your logistics. Llegamos a Chau Doc luego de un interesante viaje en fast boat desde Phonm Penh y a primera vista nos encantó. La diferencia con Camboya es notable, además la gente con sus vestidos de colores y sombreritos de punta son muy interesantes. 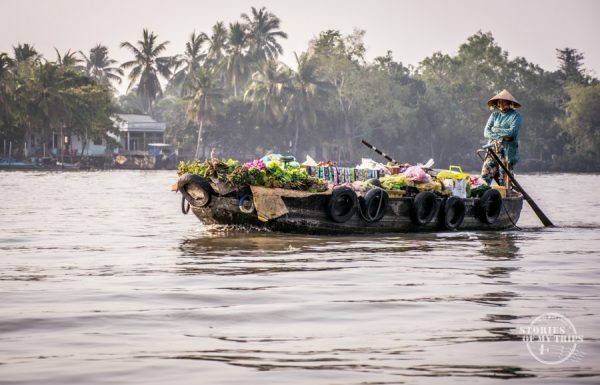 Chau Doc no es muy grande, caminamos por todo el centro y al lado del rio, tomamos un bote para pasear por el rio por $5 al atardecer y caminamos hasta la estación de buses para comprar un pasaje a Can Tho al siguiente día. 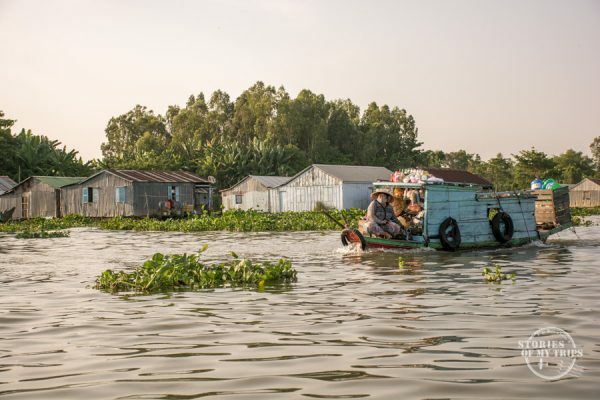 We arrived in Chau Doc after an interesting fast boat trip from Phnom Penh and at first sight we loved it. The difference with Cambodia is remarkable, plus the people with their colorful dresses and pointed hats are very interesting. Chau Doc is not very big, we walked around the center, the markets and along the river, we took a boat along the river at sunset for $5 and walked to the bus station to buy a ticket to Can Tho the next day. To get from Chau Doc to Can Tho we took a bus, but the bus station in Can Tho was quite far from the center and the only option we had was to pay a taxi to get to the hostel. We were well located and although Can Tho is quite large, we could walk to all the places that interested us. Our goal was to visit the floating markets and after a long negotiation with a tour saleswoman in the hostel, we managed to make an 8-hour tour for $25, from 5AM to 1PM. It was a bit disappointing, there were more boats with tourists than locals selling. We went on a Saturday and the guide told us that because it was Saturday there were almost no boats selling. I don’t know if this is true but try not to go during the weekend. 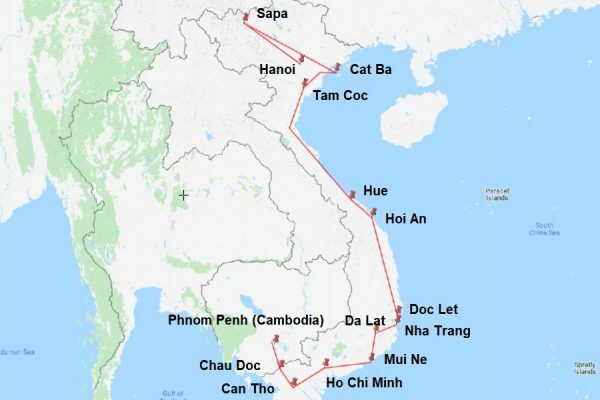 We stayed in Can Tho for 2 days and then we continued our way to Saigon (Ho Chi Minh City). We bought our ticket to HCMC from a hotel near our hostel that had the pick-up included. They came to pick us up at our hotel, took us to the bus station and we went on a very comfortable bus to HCMC. When we arrived we realized that the bus station was far from the center, but since it is a big city with public transport it was possible to take a bus for $0.25 that dropped us off near the hostel. 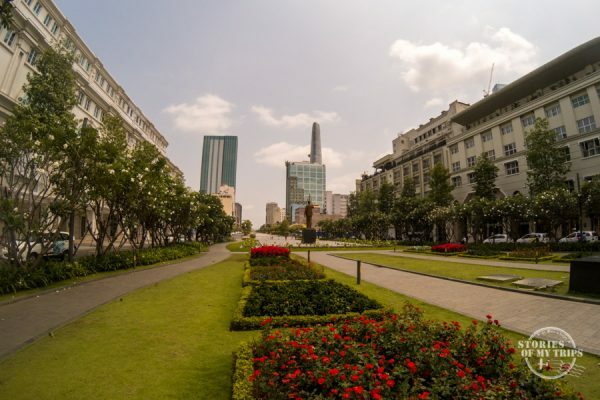 The location of our hotel was excellent, so every day we were able to walk everywhere: the Russian market, the street food market, the Independence Palace, the War Museum, etc. The difficult thing is to walk through the streets, there are millions of motorcycles so crossing the streets is an adventure, and the sidewalks are also full of motorcycles, so the few people who walk have to find space between the motorbikes. To go from Ho Chi Minh to the Cu Chi Tunnels we had two options, go to Ben Duoc or go to Ben Dinh. We chose Ben Duoc because they were the original tunnels instead of those created for tourists, it is also less visited by groups of tourists and because it could be reached using public transportation. We took bus 13 from here, for an hour and a half and dropped us off at the Cu Chi bus station. Right there we took the bus 79 for 50 minutes. The driver told us where to get off and from there to the tunnels was a15 min walk. To return to the city we took the same two buses. 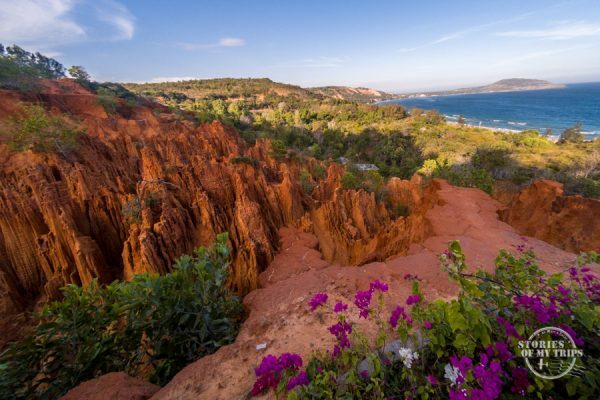 We were at HCMC for 3 days and our next destination was Mui Ne. We really wanted to visit the Mui Ne sand dunes and one of the few agencies that had direct transportation was the one in front of the bus station here. We had to wait at the office for a while until a bus arrived that was already a little full and we had to separate, it was a bed bus and it was quite comfortable for me that I’m 1.70 cm tall. For someone taller, it can be more uncomfortable. Our hotel was on the main road where the bus passed, so we asked the driver to stop and we got off in front of the entrance. The next day we rented a motorbike and went to the Fairy Stream, to the Fishing Village, we crossed the peninsula to go to the other coast and see the sea from the other side and the surfing beach and it was great, then we went to the Red Canyon which was very nice and finally we saw the sunset from the Red Dunes. Going from Mui Ne to Da Lat is very easy, we only had to buy the ticket at our hotel and the bus stopped to pick us up right there. That was a very small and very uncomfortable bus for 4 hours of travel. When we arrived in Da Lat, the bus company office was right in the center and we were able to walk to our hotel. Then we walked around the city to visit the colonial houses, the markets, and the lake. To go to the Thien Vien Truc Lam monastery, we took a taxi to the cable car station. 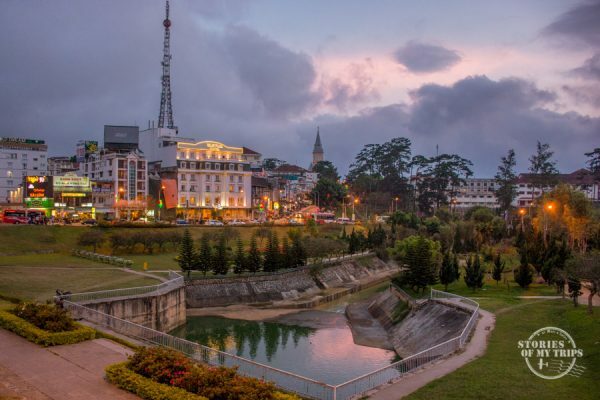 We spent a couple of very relaxing days in Da Lat and then we continued our way towards Nha Trang. To go from Da Lat to Nha Trang we went to the same office where we the bus dropped us off when we arrived, in front of the Hoa Binh Theater and we got our ticket there, the bus left from there. 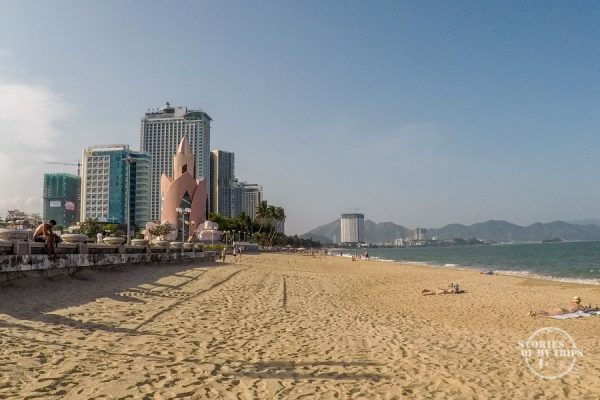 When we arrived at Nha Trang the bus dropped us off near the center so we walked to the hotel. There is public transportation in NhaTrang and there is a map in the tourist office with the routes. We took bus No. 6 to go to Long Son Pagoda and rent a motorbike to leave the city. 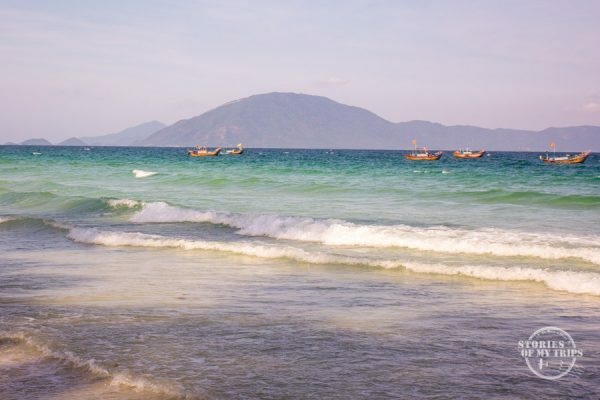 What most interested us about Nha Trang was visiting the salt fields at sunrise and visit Doc Let, a pretty nice beach. The road was very long but it was worth it. This trip can also be done by public bus, but the bus starts running at 6am, and it wasn’t going to work if we wanted to see the sunrise. In our hotel, they helped us to book the ticket to go from Nha Trang to Hoi An and the bus came to pick us up at our hotel. It was a bed bus and we traveled all night. 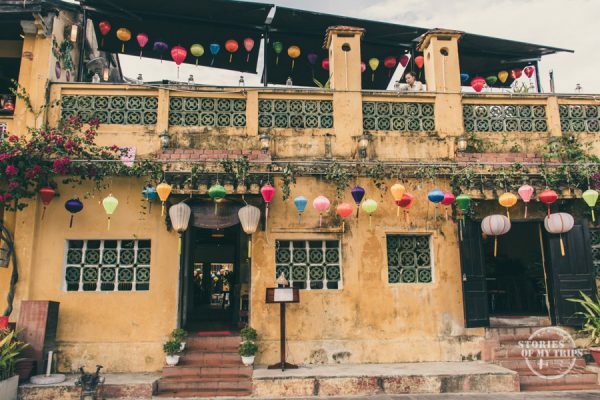 We arrived in Hoi An very early in the morning and walked to our hotel (which was by far the best of our entire trip through Asia). As it was relatively close to the center we walked all the time, but there are many people who use bicycles. 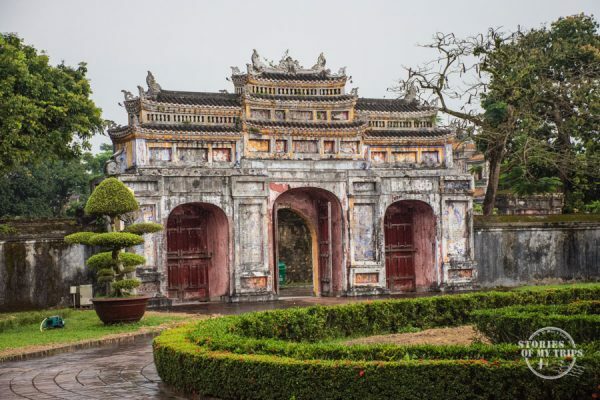 We loved this city, we stayed 2 days and then we continued our way to Hue. To go from Hoi An to Hue you have the option to take the train, but it doesn’t leave directly from Hoi An. First, we had to take a bus to Da Nang, and from there we took the train to Hue. To book the train tickets, the owner of our hotel helped us buy it as a local in order to pay the real price paid by the locals. It is best to book a seat on the right to have a better view. When we arrived in Hue we had a long walk to our hotel and then spent time walking around the center following the map of the Walking Tour from Mandarin Café and the Imperial Citadel. When we were satisfied we decided it was time to continue on our way to Tam Coc. 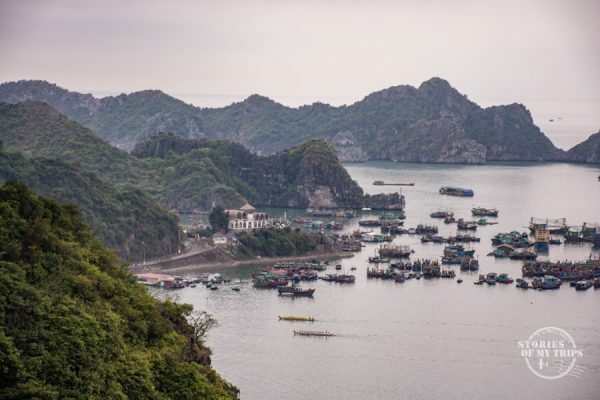 We decided to visit Ha Long Bay independently and from Cat Ba Island. To go from Tam Coc to Cat Ba we bought a ticket in our hotel to Hai Phong and when we got there we walked to the port where we bought a ferry ticket, directly in the port office to avoid inconveniences. When we arrived at the port of Cat Ba they took us on a bus that took us to the other side of the island where the city is located and our hotel was in the center so we only had to walk a couple of blocks. The city is quite small so you can walk everywhere. The weather was not very good in the days that we arrived so we waited for 3 days for it to change in order to be able to see Ha Long Bay with sunshine. After Cat Ba we had a long journey to Sapa. 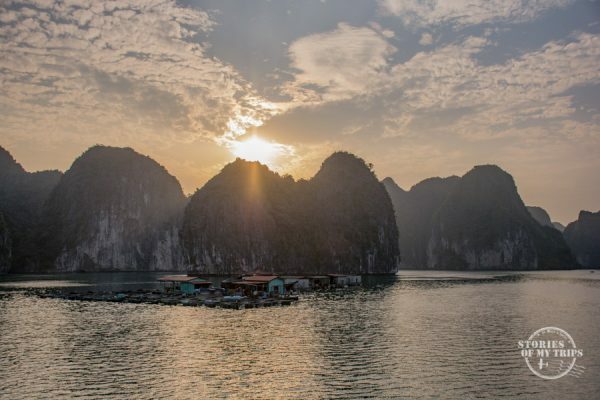 It was clear to us that we didn’t want to do a tour from Hanoi to visit Ha Long Bay, the prices and options from Cat Ba were much more reasonable and less full of tourists. 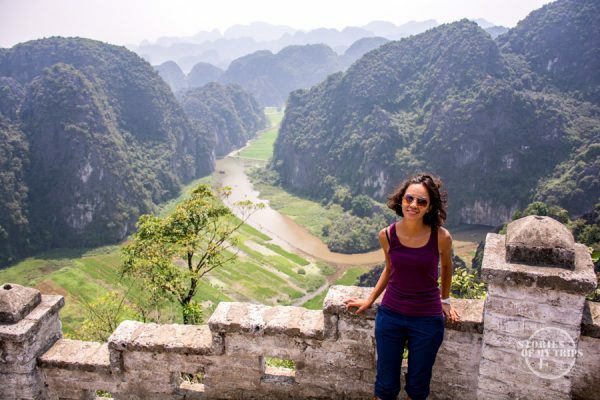 In the end, it was a great decision because our trip to Ha Long Bay was excellent and without all the problems we have read that other travelers have, like scams, robberies, super busy places full of tourists, loud music and karaoke etc. Our tour was for a less traveled route, there were no more boats in sight, we left very early in the morning and returned after sunset. Probably we didn’t go to the deepest part of the bay, but it was the best. The views we had were beautiful and we did not have to deal with the problems of going to the most popular part. 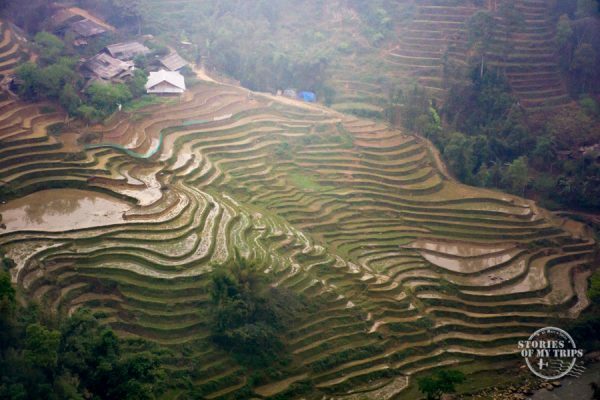 The good thing is that Sa Pa is very small and you can walk everywhere. One day we hired a guide from our hotel to take us for a trek through the rice fields and the places where the indigenous communities of the area live. The truth is that hiring a local guide is a good way to support the locals, but it is not necessarily essential to do these trekking. There are so many people on the path doing the same route that it is only a matter of following the crowd, although going with a group of locals was more fun since they told us many things about their way of living. Unfortunate, in the end, they wanted to force us to buy their souvenirs and they got very angry when we refused, although we gave them a good tip they were mad. After a couple of days in Sapa, we closed our trip in Vietnam with the last stop in Hanoi. To go from Sapa to Hanoi there are many agencies selling tickets throughout the city, and all cost the same, so we bought it in the nearest one and that’s it. To get to the bus station we had to walk a lot, the bus was late and it didn’t stop at the office where we were waiting, we had to run after it to reach it. In Hanoi, the bus dropped us off a bit far from the center, but in a city with public transportation, everything is easier. From there we took bus No. 8A that dropped us off near the lake of the Old Quarter Hồ Hoàn Kiếm and from there we walked to our hotel. From that lake, you can walk and take public transportation to different parts of the city. 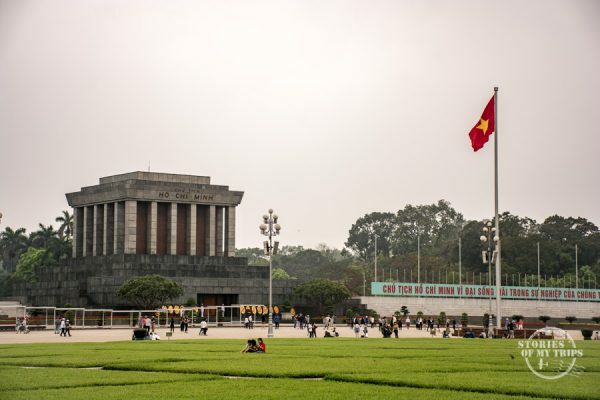 We took bus No.9 from the lake to the Ho Chi Minh mausoleum which is close to the imperial city of Thang Long and the city train (a train that runs through a neighborhood). From the lake, you can walk to Hoa Lo prison and several temples and museums. To go to the airport we took bus No. 17 that dropped us off at the domestic flight terminal and we walked to the international terminal where we took our flight to the Philippines. That’s how we ended our month in Vietnam. We left very happy and surprised of a country that we had heard several negative things, but in which we did very well and we liked much more than expected. We are even eager to revisit to go to a few places that we left pending. In future posts, we will tell you more about our experiences in each place. If you have questions, you can leave them in the comments. Posted in Routes, Transportation, Vietnam.